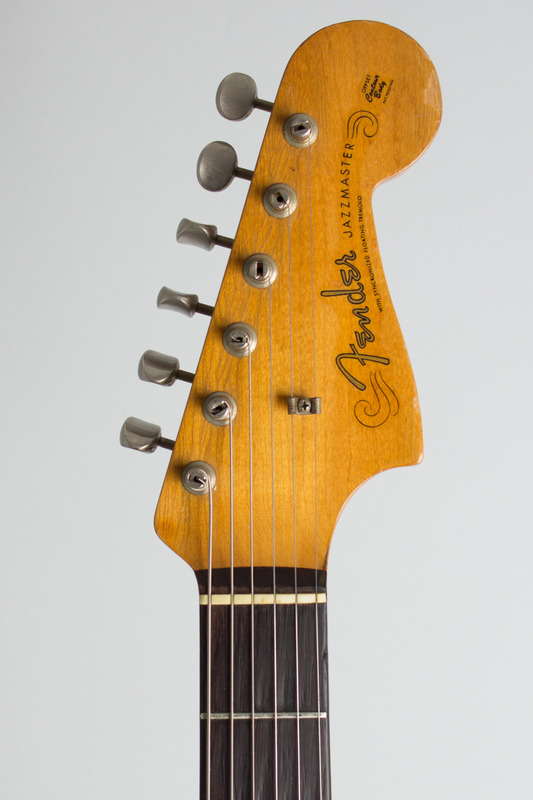 Fender Jazzmaster Model Solid Body Electric Guitar (1959), made in Fullerton, California, serial # 36301, sunburst lacquer finish, alder body, maple neck with rosewood fingerboard, original tweed hard shell case. 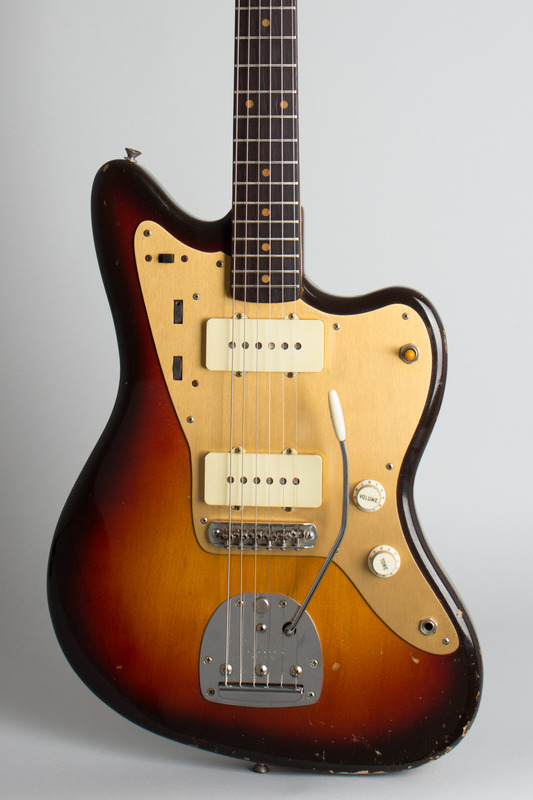 This is a lovely played-in but well cared for early Jazzmaster, with a beautiful deep 3-color sunburst and the classic gold anodized pickguard used only up to the summer of 1959. The date of 3-59 is discreetly pencil marked on the neck heel. 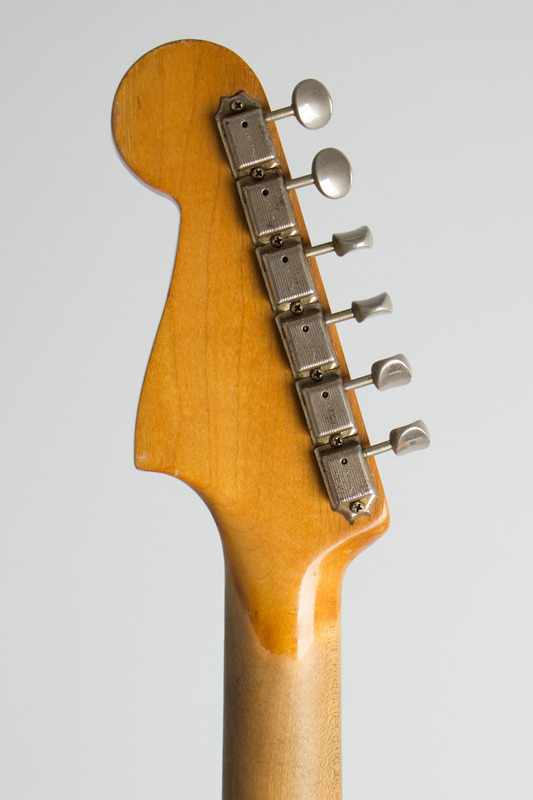 When this example was made the Jazzmaster was still a new model, and only in production for a few months as Fender's top of the line guitar. The model's novel features like the patented "offset" body, floating tremolo, and wider-coil pickups were all news to Fender users, and even if they failed to entice Gibson users to change over to Leo's products. With this new prestige product, the Fullerton factory lavished a maximum of care and effort on Jazzmaster production, and we usually find these first generation "offsets" to be exceptionally fine instruments. 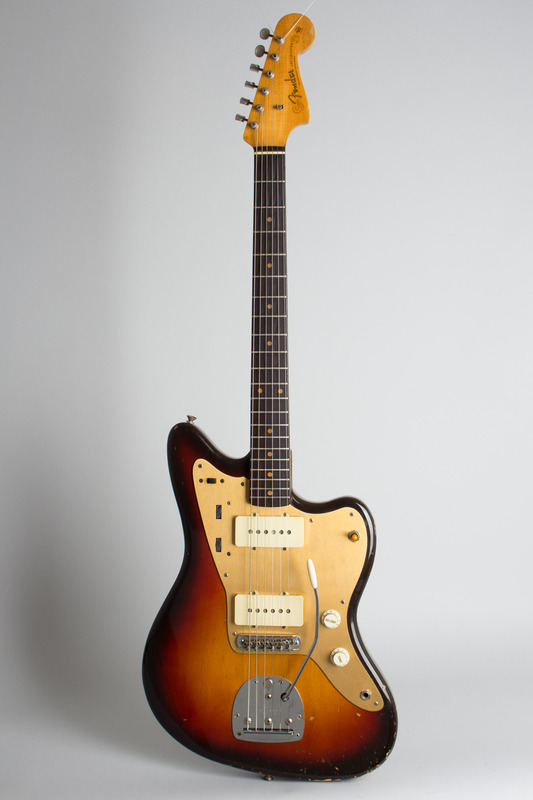 Over the last 25 years or so the Jazzmaster, once maligned, has risen to be one of the most widely played of vintage designs, and this is one of the earliest examples. Definitely used but never abused, this remains an exceptional sounding and extremely attractive twang machine. This particular guitar has a great feel and a lovely "ring" to it, even when not plugged in. Overall length is 41 in. (104.1 cm. ), 14 in. (35.6 cm.) wide at lower bout, and 1 5/8 in. (4.1 cm.) in depth, measured at side of rim. Scale length is 25 1/2 in. (648 mm.). Width of nut is 1 5/8 in. (41 mm.). 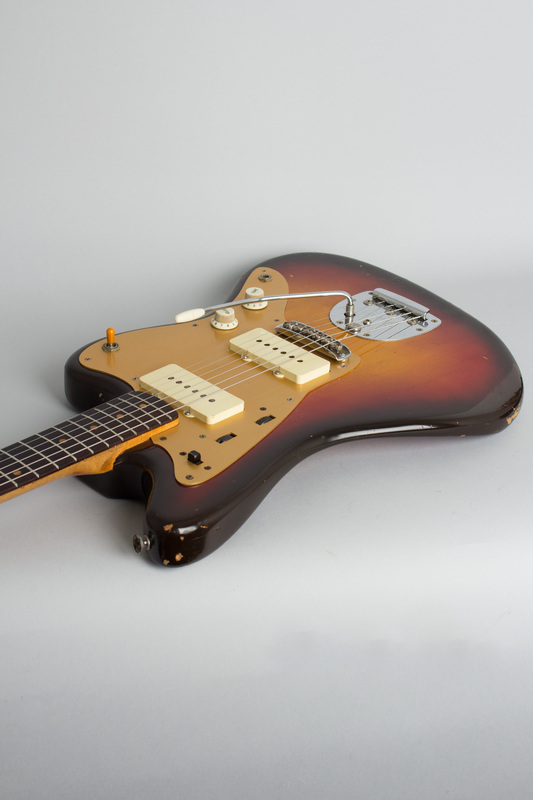 This Jazzmaster is all original with the exception of a recent expert refret. 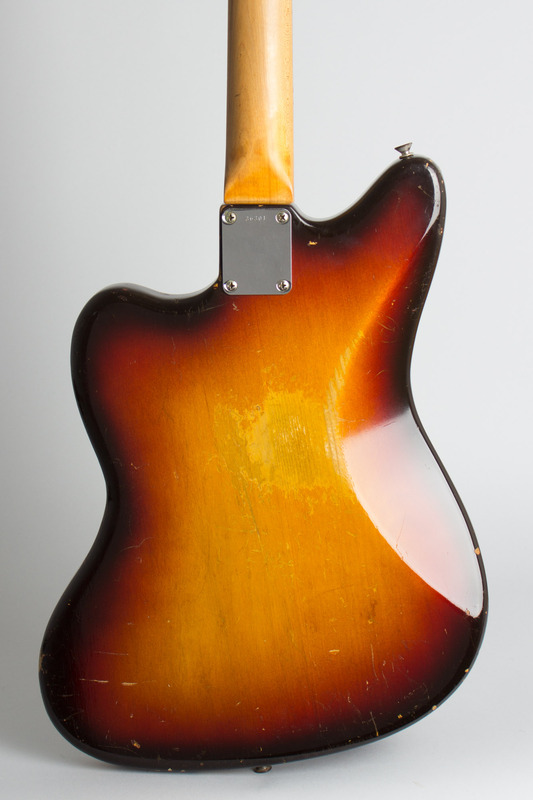 The finish wear is mostly concentrated on the back rim of the body -- it looks like the guitar was perhaps in a damp case sitting upright for a time, and that edge is fairly heavily flaked off. 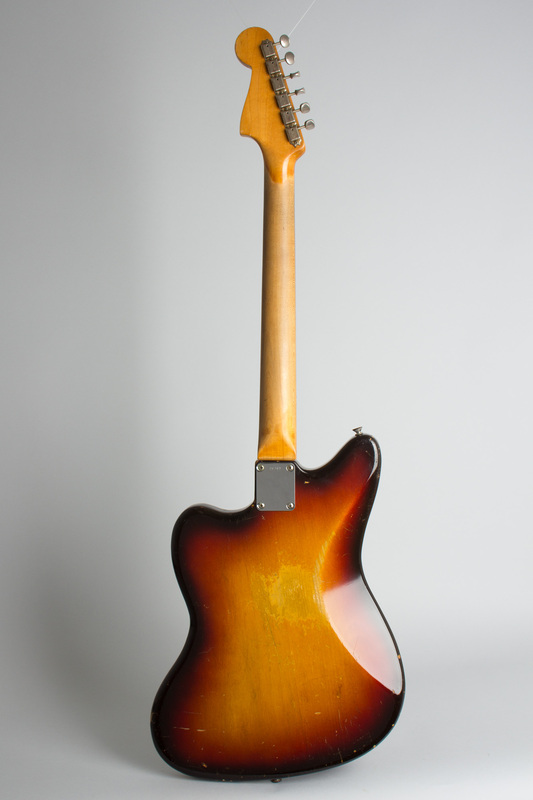 The face is quite clean by comparison, and the color in the early 3-tone sunburst is very strong. The back finish is more worn with a decent-sized spot of buckle wear in the middle and numerous small dings and chips. The anodized pickguard is also very clean, showing much less wear than most, and none of the pickwear spots that sometimes plague these lovely gold-finished pieces. Internally the guitar is completely original and untouched; the 1959 masking tape is still holding the cloth wiring rig to the pickguard. The back of the neck is well worn-in as well, and this is a great-feeling and superb-sounding guitar with the "old Fender" vibe in spades. The original tweed case is quite well-worn as well but still fully functional. Excellent - Condition.